MOSCOW, October 11. /TASS/. Russia and Bolivia can boost military and technical collaboration, President Vladimir Putin said during the ceremony to receive credentials from new ambassadors on Thursday. "There are prospects for boosting cooperation in the military technical, mining, educational and other fields," he told Ambassador Hugo Villarroel Senzano. Putin noted that this year marks the 120th anniversary of diplomatic relations established between the two countries. He also mentioned the talks with President of Bolivia Evo Morales held in Moscow in June. 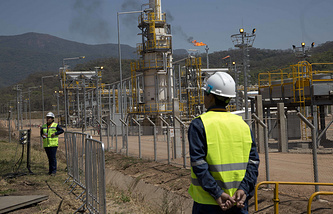 "Russian companies are implementing large energy projects in Bolivia. The Bolivian nuclear research and technology center is planned to be put into operation next year," President added.